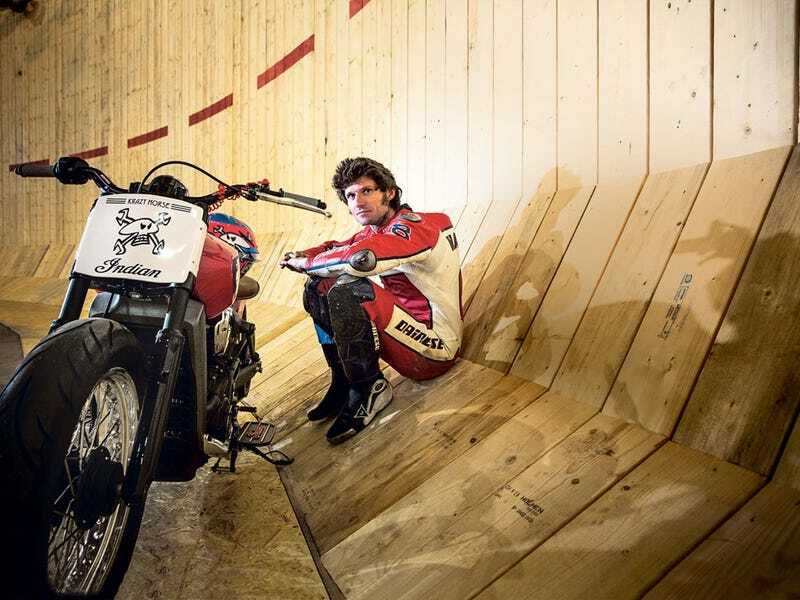 When it comes time to try and set a world record on something called the “Wall of Death,” there’s only one person to call: crazy-feat performing and crazy-fast talking Guy Martin. Yesterday, Martin did just that. For the uninitiated, the wall of death is one of those crazy silodrome, barrel -looking things motorcyclists ride parallel to the floor inside of. Popular at carnival attractions since the early 20th century, it’s one of the oldest forms of vehicular insanity. And until this week, the world record top speed was 60 mph. The normal speed most riders travel in a silodrome is around 22 mph. For Martin to go faster than 60 mph in a normal silodrome, he would have been subject to over 10.0 Gs which is more than the human body can handle (fighter pilots wear special suits and train so they can withstand 9 Gs). A bigger wall was built just for the attempt which is 40 meters in diameter, but that created a new problem. The same amount of force is required to stick to the wall (2.5 Gs), but in order to achieve that now Martin would need to hit at least 58 mph. So, the wall of death rookie was not only attempting to set a record, but he was making getting on the wall in the first place much more difficult. I felt all right. Well, I lost my vision, but I was still conscious. I know I’m going to black out, but it’s good. I will get a warning before I black out. Maybe I’ll black out before I pass out. That’s called GLOC, which stands for G-induced loss of consciousness. To put it succinctly: LOL. Fortunately Channel 4, the English channel hosting the whole thing, put his attempt on a time delay should the unfortunate happen. Even more fortunately, Martin completed his record attempt, smashing the previous record with an initial run of 70.33 mph and then a final run of 78.15 mph. It was later confirmed that he hit 5.2 Gs on his run. The attempt is part of a show called Speed With Guy Martin, where his next feat will be to break the 200 mph mark in a Transit van. Just because.